You are currently browsing the Bookmobile News weblog archives for March, 2015. Building on our strong relationship with Umpqua Bank, we are thrilled to welcome the Sonoma Umpqua branch to our list of book donation sites. We hope that this is a convenient location for many of our supporters in the Sonoma Valley — we want your books! Please consider which titles from your collection would be most appreciated by others and bring them in. If you don’t see a book bin in the bank lobby, just let one of their friendly staff know about your contribution and they will take the books behind the counter for us. The location is 135 West Napa Street #101, Sonoma, and can be reached at 935-7800. Check the map below and come on by! It’s the yummiest time of the year! Be sure to mark your calendar for Wednesday, April 8 for the return of Chocolate & Cinema to the Rialto Cinemas in downtown Sebastopol. From 6:30 – 7 Pm, sample prize-winning truffles, handmade chocolates, moist brownies, and other offerings from Sonoma County chocolatiers. Step inside the Free Bookmobile to browse our shelves for a great new read to take home. Then at 7:15, settle in to enjoy an old favorite on the big screen: Fried Green Tomatoes, starring Kathy Bates, Jessica Tandy, Mary-Louise Parker, and Mary Stuart Masterson. All this and the warm company of your fellow book lovers is included in the $35 ticket. Click here to zoom right over and purchase yours on our Brown Paper Tickets event page (you can also pay at the door). 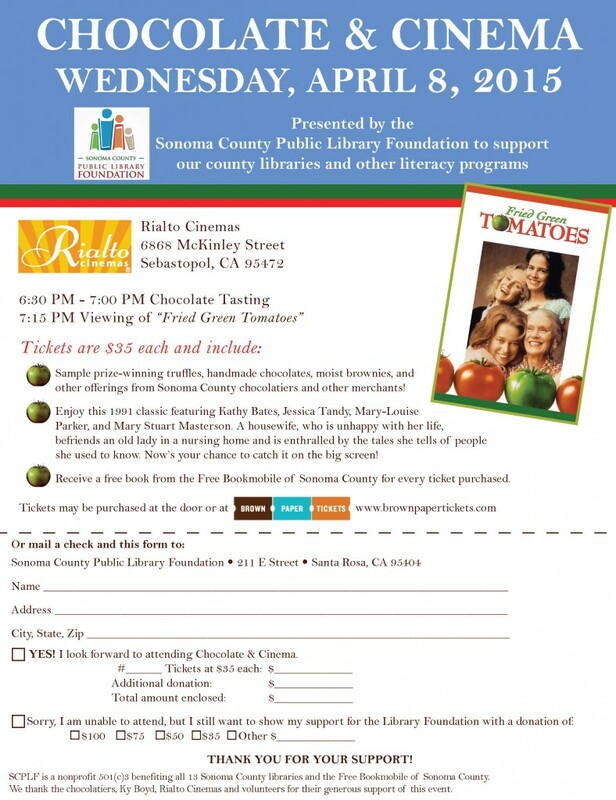 Because the chocolate and movie are generous donations to this event, 100% of the proceeds will benefit the Sonoma County Public Library Foundation’s efforts to promote literacy, support special programs for the county library system, and, of course, keep the Free Bookmobile rolling steady! Even if you can’t make it that night (or — gasp! — are not a chocolate eater), this is a great time to make a tax-deductible contribution to our important work. You can use the form below, click here for our website donation page, or just send a check to SCPLF, 211 E Street, Santa Rosa, CA 95404. In our first-ever grant win specifically for our Adult & Senior Services, we are elated to join the carefully selected group of programs that Sonoma Wine Country Weekend (SWCW) supports. SWCW is Sonoma County’s signature, and largest, charity event, bringing together over 200 of Sonoma’s top winemakers and growers, along with a collection of the area’s best chefs. Jointly produced by the Sonoma County Vintners and the Sonoma Valley Vintners & Growers Foundation, all proceeds benefit local charities. Since its inception, Sonoma Wine Country Weekend has raised over $12 million for charities that benefit students, children, farm workers and people in need in Sonoma County communities. SWCW’s generous grant will help us bring high quality books free of charge to thousands of adults and seniors throughout Sonoma County in the coming year, especially those who are most challenged for access. This includes service directly to the residences of the frail and elderly, rural populations, residents with low incomes, farm and migrant workers, denizens of dense urban environments that lack a culture of reading (such as Roseland and the Sonoma Valley Springs area), and other underserved adults. At these bookmobile visits, all patrons will be able to browse and select books of choice to take home and keep as long as they wish, including audio and large-print titles for seniors with vision challenges, Spanish-language materials, and books that are specifically geared toward ESL learners and their families. We look forward to a long and productive collaboration as part of the Sonoma Wine Country Weekend family. Thank you!